The Paradise Parrot (Psephotus pulcherrimus) was an unusually colorful medium-sized parrot native to Queensland - New South Wales border area of Australia. Once moderately common within its fairly restricted range, the last live bird was seen in 1927. Extensive and sustained searches in the years since then have failed to produce any reliable evidence of it, and it is undoubtedly extinct. 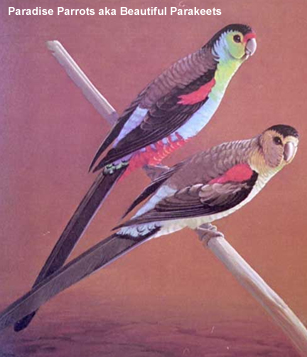 Paradise Parrots lived in pairs or small family groups, making their nests in hollowed-out termite mounds and similar places, often at or near ground level, and feeding, so far as is known, almost exclusively on grass seeds. The reasons for the sudden decline of the Paradise Parrot remain speculative. Possibilities include overgrazing, land clearing, changed fire regimes, hunting by bird collectors, and predation by introduced mammals like cats. It became rare towards the end of the 19th century and was thought extinct by 1915. A series of searches turned up a few more individuals over the next decade, but the last confirmed sighting was on 14 September 1927. This parakeet averaged 10.5 inches / 27 cm in length - and nearly half of its length was the tail. The plumage was very colorful - a beautiful mix of turquoise, green, red, black, brown-orange, and blue. The forehead was red. The eye areas were green-yellowish. The cheeks, throat and breast emerald-green turned turquoise on the sides of body. The crown and nape were black. The hindneck was brownish-black. The back, lower back and flight feathers were greyish-brown. The median and outer lesser wing-coverts, the center of the abdomen, the under tail-coverts and thighs were red. The bend of the wing, the primary wing feathers, the outer webs of primaries (longest wing feathers), the outer secondaries (shorter, upper "arm" feathers) and under wing-coverts were blue. The middle tail-feathers upperside were bronze-green with blue-black tips. The outer tail-feathers were greenish-blue with whitish-blue tips. The tail underside was white-bluish. They had a grey bill and narrow grey periophthalmic rings. The irises were brown and the feet greyish-brown. Hens had a dull yellowish-brown forehead. The sides of the head, throat, breast and sides of neck were dusky brownish-yellow. The feathers had brownish-orange tips. The abdomen and under tail-coverts were pale blue with a little red to the abdomen feathers. The lower back, rump and upper tail-coverts were pale turquoise. The lesser and inner median wing-coverts were dull red. The edge of the wing, under wing-coverts, primary wing feathers, outer webs of primaries (= longest wing feathers) were grey-blue. There was a pale stripe to the underside of the wing. Looked like like female. However, young males had some emerald-green to their cheeks and breast, darker crown and nape as well as darker red to their wings. The under-wing stripe was present. The bill was more yellowish.